When a disc herniates, the disc nucleus can push outward through the disc wall and impinge and put pressure on a nearby nerve root that branches off from the spinal cord. When that happens with a lumbar disc in the LOW BACK, the symptom might be pain that radiates into the flank or even pain that radiates into a foot. 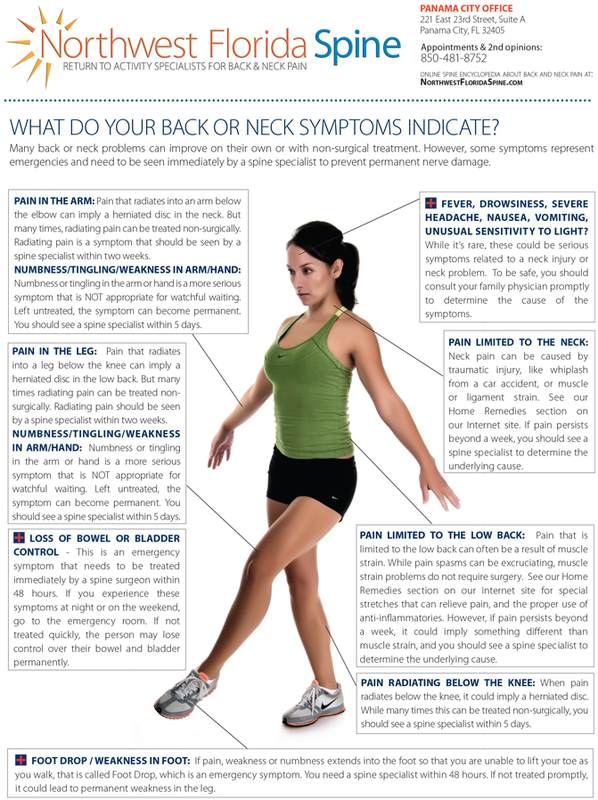 For a herniated disc in the NECK, the symptom might be pain that radiates into an arm, or even down into the hand. With the symptom of RADIATING PAIN, the person CAN USE WATCHFUL WAITING for a few weeks to see if non-surgical treatment options, like spinal injections, can provide relief without surgery. It will be very uncomfortable as the symptom of searing pain in a leg, foot, arm or hand can be extremely disabling. But radiating pain is not necessarily an emergency signal. This is NOT the case with NUMBNESS or WEAKNESS in a foot or hand. This weakness can also be seen when the person is unable to lift the front of the foot when they walk. This is called FOOTDROP. These are all EMERGENCY SIGNALS that you need to see a spine surgeon within 48 hours, or this numbness or weakness could become permanent. The reason is that the disc is putting excessive pressure on the nerve root causing “neurological deficit”. If you don’t remove the pressure on the nerve root, it could be permanently damaged. Another emergency signal is LOSS OF CONTROL OF BOWEL OR BLADDER. Most people don’t associate this symptom with their back problem, but this can be an emergency signal where the disc has herniated and is compromising the area of the spinal cord that controls your bowel or bladder function. This symptom is extremely serious and you need to see a spine surgeon within 48 hours. Again, YOU CANNOT USE WATCHFUL WAITING FOR NUMBNESS, WEAKNESS OR LOSS OF CONTROL OF BOWEL/BLADDER. You need to see a spine surgeon within 48 hours to prevent the symptom from becoming permanent.